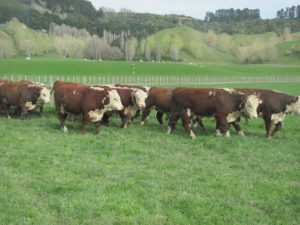 Riverton Ezicalve Herefords are bred for superior calving ease and low birthweight, in an uncompromising commercial environment that produces proven cattle with accurate EBVs. Our vision is for dairy and beef farmers to have confidence calving two year old heifers, producing a quality beef calf whilst reducing the risk to their heifers. 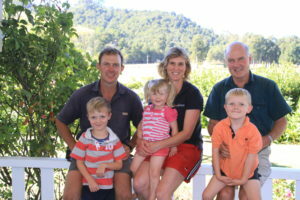 Mike and Cath Cranstone are the fourth generation of the family to farm at Fordell, Wanganui, and continue the genetic progress of the Riverton Hereford Stud. The stud was established in 1905, making it the oldest Hereford Stud in New Zealand. The property is situated in the Whangaehu valley and comprises 1650 eff ha of sandstone hillcountry supported by fertile riverflat. The property is farmed intensively carrying 18,000 stock units, with the 630 cows calving and competing with 8,000 breeding ewes. Key components of the Riverton hereford Stud’s breeding programme. Stock run in large mobs in challenging conditions providing accurate performance data. Strict culling policy based on performance. Great service and back up bulls provided.